• Hidden: This is an attribute of a file or directory in Windows. You may change this attribute in the file or directory properties dialog in the Windows explorer. • Exclude files that exist....: If a file matches this description, Easy2Sync will completely ignore it. • Hidden: Thos is an attribute of a file or directory in Windows. You may change this attribute in the file or directory properties dialog in the Windows explorer. 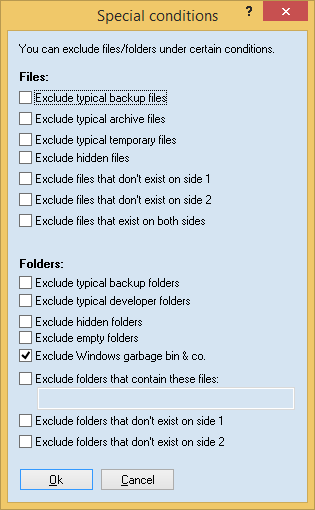 • Exclude folders that exist....: If a folder matches this description, Easy2Sync will completely ignore it.